A “disciplined free spirit” … that is officially my new life goal! Also, I want to change my name to Bunnie. This was such a funny, inspiring, and yes, cosmic conversation with Los Angeles based artist Bunnie Reiss. I only discovered her work last month, but the moment I did, I knew I had to have her on the podcast! 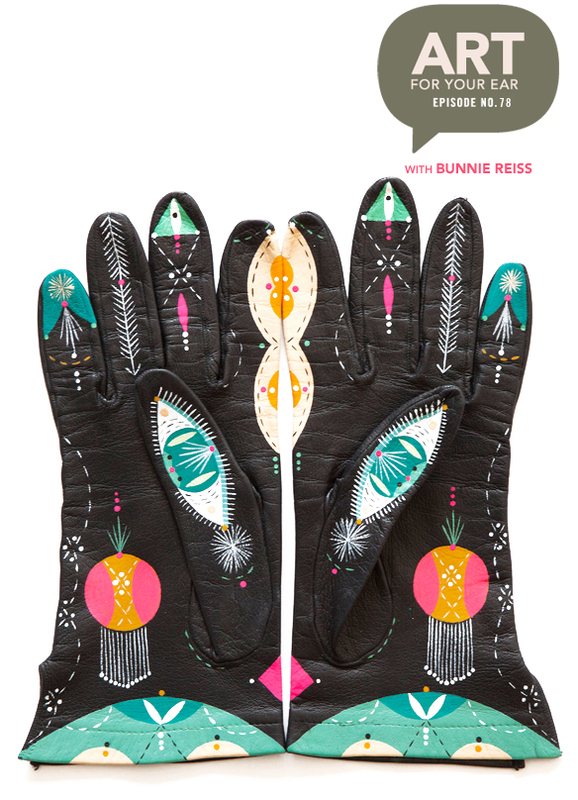 You can listen right under those fabulously “cosmic animal gloves”, or you can subscribe on iTunes. Beautiful! It’s currently sold out (no surprise! ), but she’s organizing another run very soon so keep your eye on her shop! See? We weren’t kidding! Boots, walls, books, and yes, her car. Oh, that photo makes me so happy. 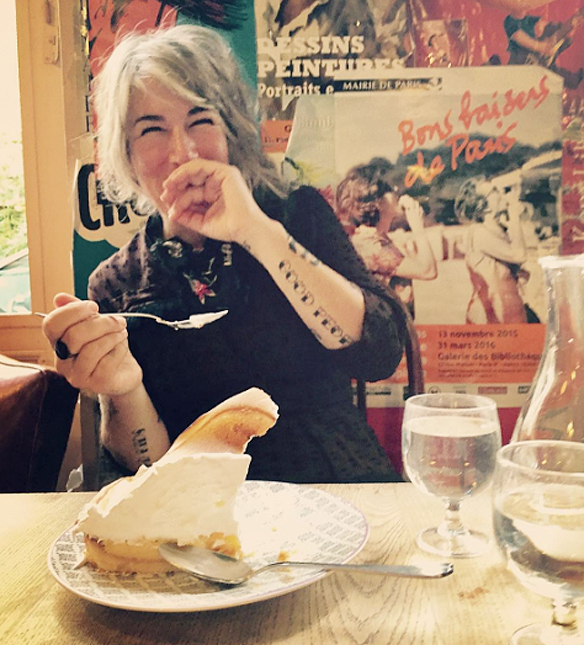 Sunshine, laughing, and a GIANT lemon pie in Paris. Ah, oui… c’est parfait. Thank you so much to Bunnie for doing this with me and sharing all of her goosebump-inducing wisdom; thanks to Saatchi Art for supporting yet another episode; thanks to audible.com for making my new book into an audio book – it’s officially available now – and of course, thank YOU so much for listening! There will be more art for your ear next weekend. Lovely lovely!! SO inspiring and totally love the idea of the scaffolding grid and lemon meringue pie! Loved listening to this one. Bonnie has a great life and artistic philosophy. I was so excited to see who was on deck for today’s interview! Bonnie did an amazing mural in Milwaukee recently – the spirit of her work is so lovely, and both her work and work philosophy are so inspiring. Thank you so much to both of you for letting us listen in on your chat! I love that Bunnie would choose to be a bird!!! Her passion is contagious. So many bits of knowledge to gain from this — I am in awe. Life doesn’t give us a “do – over.” I am going to have to invent a way for these podcasts become virtual interviews. I’ll send in the application for the patent as soon as I finish my meditation. Those boots are pure genius! So dreamy! I think her work might be my favorite yet. Those colors and shapes with a dash of whimsy…I cannot get enough! I so hope her dream of painting a full house and yard comes to fruition. What a spectacular vision! me too! i’m sure it will happen… it has to! Oh how she creates magic, especially with the dots and fine lines! Catching up on the podcast episodes. This is a delightful interview. I absolutely love her work and she seems like a beautiful soul. I checked out Bunnie’s website and now I want to follow the Bunnie trail and see those murals!!! So wonderful. Thanks Jealous Curator for introducing me to another incredible inspiring artist!